First Hotel Fridhemsplan is a modern and completely renovated and affordable hotel in central Stockholm,,en,The hotel is located on Kungsholmen,,en,minutes from Stockholm Central Station and a short walk to beautiful Norr Mälarstrand,,en,All rooms and suites are modernly furnished with Jensen quality beds and LED TV,,en,The new bathrooms are spacious,,en,fresh and deliciously designed with tiles and marble,,en,Nearby is the Fridhemsplan bus station,,en,By bus line,,en,towards,,en,Gullmarsplan,,sv. The hotel is located on Kungsholmen, 10 minutes from Stockholm Central Station and a short walk to beautiful Norr Mälarstrand. All rooms and suites are modernly furnished with Jensen quality beds and LED TV. The new bathrooms are spacious, fresh and deliciously designed with tiles and marble. Nearby is the Fridhemsplan bus station. 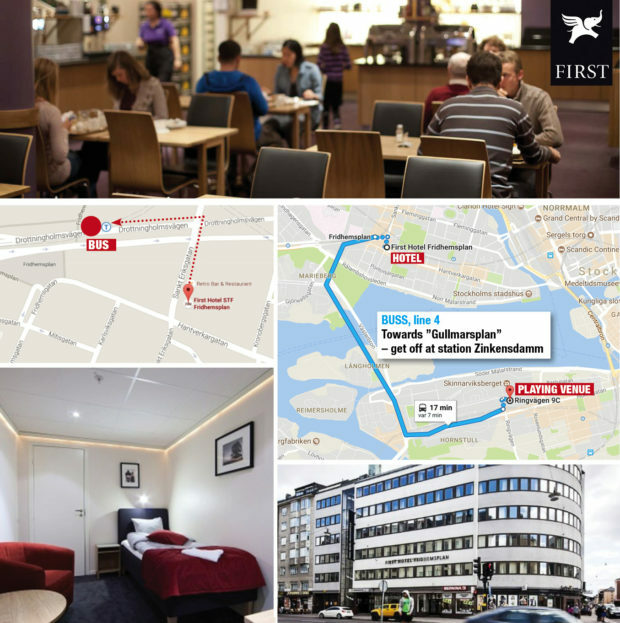 By bus line 4 (towards “Gullmarsplan”), you will reach the playing venue Stockholm’s Chess Salons within,,en,Pricee,,en,Single room,,en,cabin,,en,no window,,en,breakfast included,,en,Double room,,en,SEC,,lt,Booking code,,en,First Hotel at Fridhemsplan,,en 20 minutes. Single room, cabin (no window) (breakfast included): 750 SEK. Double room, cabin (no window) (breakfast included): 850 SEK.